The popular Apple iPod is primarily a music player, but it also has a modest set of organizer functions, just like a PDA (both the full size and Mini versions). The iPod can store and display Contacts, Notes, and a Calendar. These items cannot be created on the iPod since there is no data entry interface, but they can be easily transferred from the host computer. You don't have to use iTunes - Apple has used standard file formats for these items, so you can simply export items directly from common Windows and Mac software to the folders Contacts, Notes, and Calendar on the iPod when it is attached as a removable disk drive via USB or Firewire. Each Contact is a separate file in vCard format, each Note is a separate file in text format, and one or more Calendar entries can be stored as ics files. Both standard Mac software and Microsoft Outlook can export all of these formats. If only they could get together so easily on the music file format! The iPod screen is as big and clear as a typical PDA for reading information, and it has a backlight which can be turned on and off. The scroll wheel works as well for scrolling rapidly through a long list of contacts in alphabetical order as it does for music files. 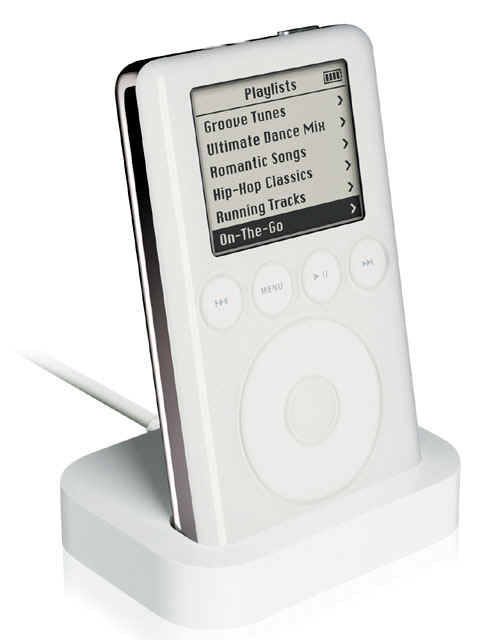 The iPod has a built-in clock which can display the current time and date on the screen, and it has a daily alarm function which can beep or play music at the pre-set time. The alarm beep uses the same internal speaker which makes the clicking sound of the click wheel, but it's so faint that it could only be heard in a very quiet room. iPod Notes actually support hyper-linking to other Notes or to music - look for the file ipodnotereader.pdf on Apple's support site for instructions. You can use Notes to construct custom menus, organize contacts, link lyrics to songs, or even make a text adventure game. Notes can also be organized into folders which appear on the menu (this feature would also have been very helpful for Contacts, for example to separate Business and Personal Contacts, but strangely folders are not supported for Contacts). Since the iPod functions as a Firewire or USB removable disk drive in Windows (no driver needed for WinXP), you can use it to store and transfer any type of data files up to the available disk capacity. Data transfers are very fast, up to 10 Mbytes/sec. Apple has enabled the iPod to easily load updated firmware from the computer, so new features can be added from time to time by downloading the latest Updater from Apple. The internal hardware is slightly different from one generation to the next though, so not every feature is backwards-compatible. Unfortunately the firmware does not support custom extensions, so other software developers can't create add-ons for the iPod. In summary, it's not going to replace a Palm PDA - but if you already have one, it can serve as a reasonable pocket organizer.